Gregory Benford is very proud of America's place in the world and its contributions to the world's culture, especially science. He reminded us that as early as the 19th century, French writer Jules Verne could foresee America's upcoming technological dominance, since he set his book on the trip to the moon in the US, not France. Verne thought Americans will be the ones to go to the moon, despite America being involved in a civil war at that time. The rise of science fiction fandom is another American contribution to the world culture that makes Gregory Benford proud. The 20th century is unique for emergence of a great literary pop culture, and SF fandom was what created it. "We already have a phenomenon where we live in the genre," he said. "You can literally go to an SF con every weekend in US. Not that I advise it." This American phenomenon has now spread across the world. Benford noted there are now at least five SF magazines in China, and the largest has a circulation of over 400 000. The circulation of the smallest SF magazine in China is bigger than the circulation of the biggest SF magazine in the US (probably Analog). The Chinese readers of the genre are interested in stories about technocratic future, about technological advancement. Benford sees this as evidence of the influence of American science and SF on the world, and does not hide his pride in it, putting it in such blunt terms as "We own the future". Science fiction -- a canary in the coal mine? However, not all is rosy in the future, whether we "own" it or not. Gregory Benford is troubled by the fact that in the US fantasy outsells SF by several orders of magnitude. What does that say about our culture? Does that mean we have become afraid of technology? Science fiction has become darker, Benford notes, adding that fantasy to him is always dark. "Lord Of The Ring is not about a joyous celebration, it's about a war." And utopian novels in SF, so prominent in the 60s and 70s, are scarce these days. So does America, the inventor of science fiction and much else, is afraid of the future now? asks Benford. "I always thought that SF is a canary in the coal mine. I wonder if it's a bad sign for the US that we have lost our faith in the future?" Of course there are lots of reasons to be concerned with the future. Gregory Benford has strong opinions about what are the most important problems facing the humankind, and what should be done about them. A self-professed libertarian, he spared neither the left nor the right his criticism for dealing with current problems. These times remind him of the 70s. "We have a failed Republican president, and it looks like he'll hand things off to a new incompetent Democratic president," he said. (This took place before the 2008 presidential elections -- E.) "Barack Obama reminds me of Jimmy Carter [...]"
The most pressing problem, unsurprisingly, is global climate change. Benford starts with pessimistic news: carbon restriction is not enough. To make matters worse, methane is bubbling into the atmosphere through the holes in the Arctic ice cover, making the global warming even worse. Benford thinks humankind won't address this problem effectively as long as it treats it as a moral, not an engineering problem. As long as the only proposed solution is to restrict our consumption, global warming won't be reversed. But Benford believes US is capable of seeing things as engineering problems. "When pressed, US will not wring its hands, but put on gloves." So what kind of engineering solutions to the problem could possibly work? One may be carbon sequestration, but "there is not even a desktop experiment that shows how it works," said Benford. He places his hopes into the second method: to reflect sunlight. "It's the absolute simplest possible technology," he said. "If you simply whiten the roofs, and change the reflectivity of blacktop, you can have a significant effect on local temperature. California has known about this for a long time, but nothing has been done. UCLA in 1995 did a study and showed that you can lower the temperature in Los Angeles in the peak of summer by merely whitening the roofs and blacktop and growing more trees. When you are driving on a light-colored road, the friction correlation of tires drops, and you get a better mileage just simply by driving on a light colored road. Nothing has been done in California. I think they will evetually do it, but very slowly. You can each do it individually. Everytime you replace the roof, make it lighter." 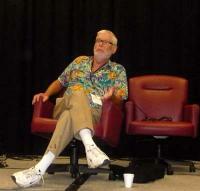 Gregory Benford at his Guest of Honor keynote at Fencon 2008. More pictures from Fencon 2008 can be found in my photo gallery. But the big way to do it, he says, is to put aerosols in the atsmophere. "Volcanoes do that," said Benford. "You can do that artificially. All climate models show that by releasing aerosols into the atsmophere you can get back the Arctic of the 1900s in just a few years. Sulfates .... if you put this stuff up at 60,000 feet, very very little of it, as dust, will reach the surface. You can get the Arctic back for about 300 million dollars a year. Same for the Antarctic. In other words, for nothing." The problems with this approach are mostly political, said Benford. Who gets to say what temperature you set on the global thermostat? "There is Arctic council, but it does not actually have control over the Arctic," he said. There are no treaties that govern what anyone does in the stratosphere. It would seem that nothing can prevent any government from carrying out experiments in the stratosphere, yet most governments will be very reluctant to try the aerosol approach. Benford attributes this reluctance to political correctness. "This is not right wing, evangelical interference," he said. "It's left-wing, environmentalist interference. The objection of the left is that it's not "pure"." When asked by a person in the audience if it is politically incorrect to worry that messing with atmosphere may have upredictable results, he replied that such worries are justified, but "that's why you do engineering." People worry about unpredictability of the results, and they also worry that such tactics can be used for warmaking. Benford dismissed the latter as unlikely. Release of aerosols into the atmosphere would be would be a very blunt warmaking instrument, because you can't control where that stuff migrates. In light of government's resistance, Benford thinks the initiative to fight global warming with aerosol release will come from private sector. Bill Gates has already began to put money in this area of research. Curiously, his reason -- and Benford claims to have heard this straight from the horse's mouth -- is that he wants poverty become a front page issue again. It won't until global warming is solved. The second major problem facing the humankind, according to Benford, is necessity for space travel. Space travel will be necessitated by the looming shortage of resources. Indium and germanium are already in short supply, and their prices are rising rapidly, noted Benford and quipped: "There's a number of particular rare Earths, which, because they are rare, are not in the Earth anymore." He thinks humanity needs to have a space infrastructure by the end of the century, but the chances of that are not good. He proposes nuclear rockets as a way to go. "It's essentially steam rockets," he said. "All rockets we know are steam rockets. What comes out the end? Steam. You can actually fly around the Solar system in large vehicles using nuclear power." The third major problem facing the world is overpopulation. Gregory Benford admitted he didn't have good ideas for dealing with that yet. Somebody in the audience asked him if he is in a group called Sigma, a group of SF writers that advises Darpa. He said yes, but advising them is like advising a house cat. What you say to a house cat may not have much effect.